I've been having a great Christmas holiday in Nelson, British Columbia with my family. I snowshoed for the first time since elementary school, and I really enjoyed it! It's so great to be out in the woods. And the trees look so beautiful covered in snow. I hope everyone is having a cozy, and friendly holiday as well. I made a blog post before about the illustrated map of Canada I created for Nature Canada. Now I wanted to show you how I completed it as a personal art piece. For the client artwork, I scanned in all the elements separately, so they could be moved around and scaled down as necessary to fit with the text and the layout. 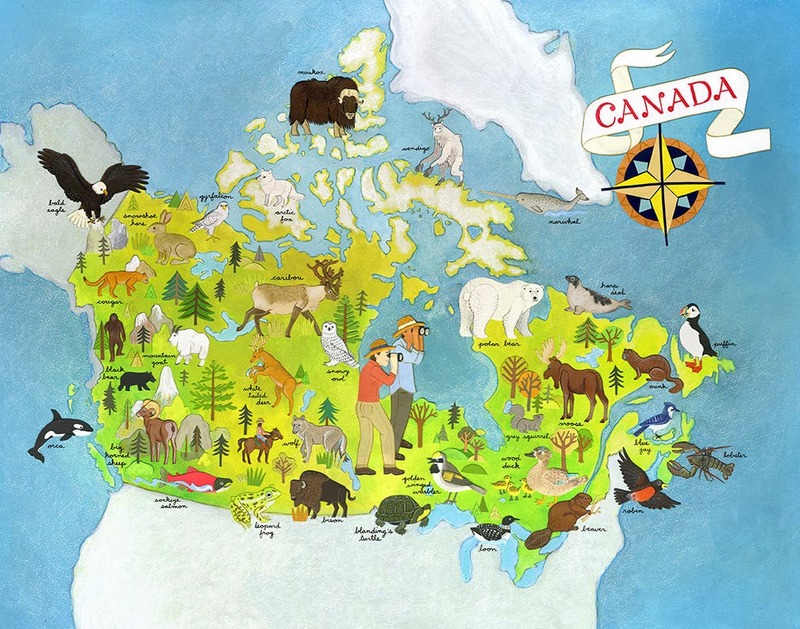 After the job was complete, I took my time illustrating more animals and slowly planning out and pasting down all my little critters and foliage pieces. Below is a photo I took of my messy studio space while in the throws of it. At the end, I decided it would be nice (and a little educational) to include labels of the names of the animals. I wish I could have included even more animals to the final artwork ... but I suppose there's always a limit. 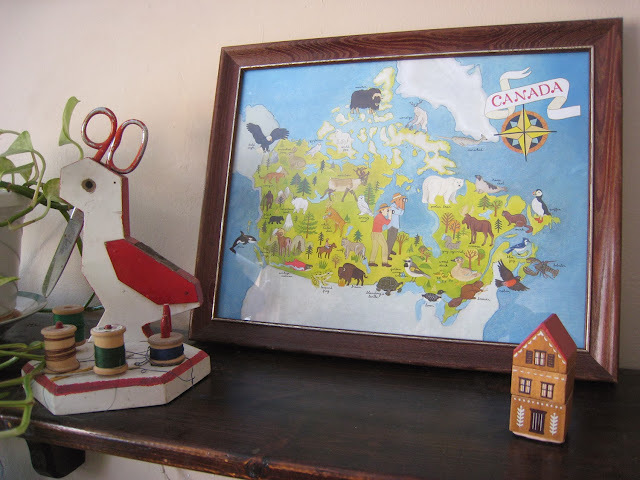 I have prints of the Animals of Canada Map up in my Etsy shop! The print is 11"x14" which is a standard size for easy framing. Skier Riding Caribou Home - 10 1/2" x 13"
I have a few framed originals up for sale in my Etsy shop! You can check them out here. 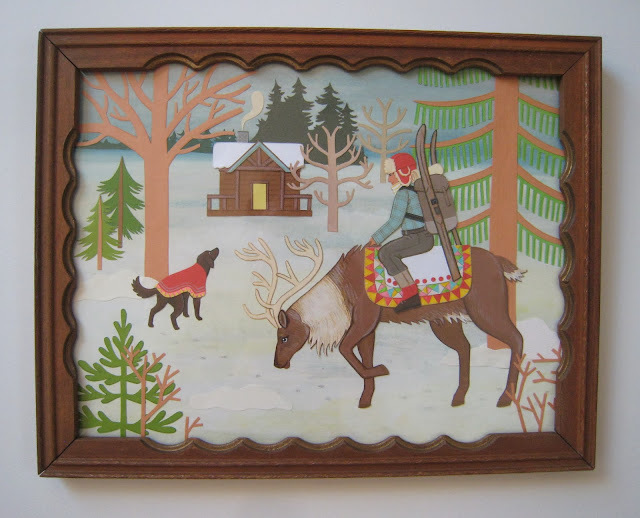 I take great pleasure in seeking out lovely vintage frames. I love the scalloped details on these. I feel like they work so well with the soft, snowy illustrations. 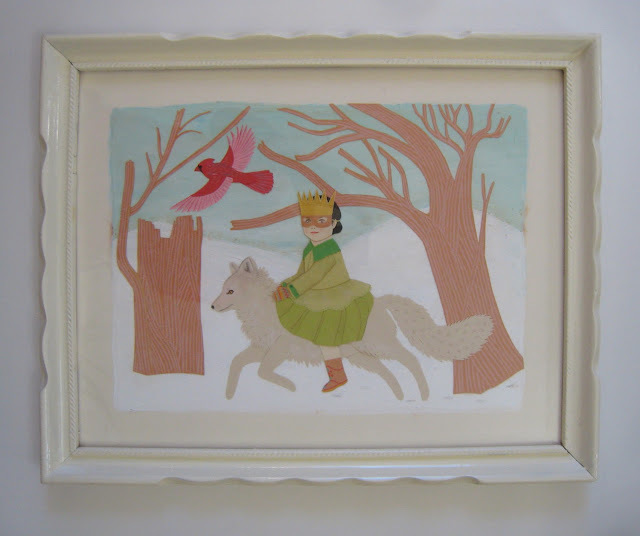 Girl Riding Arctic Fox - 11 3/4" x 8 1/2"
I always frame my original art behind high quality, plexiglas. So there is no fear of breakage during shipping. 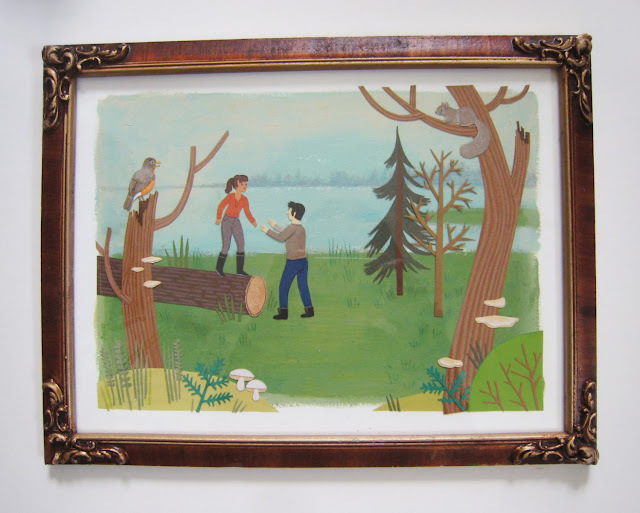 Meeting In The Forest - 10 3/4" x 7 3/4"